On MSNBC you can call a sitting president a "murderous" "fascist" even muse about putting the President on trial for war crimes, so long as that president is a Republican. But if you dare call a Democratic president a "d–ck," as MSNBC analyst Mark Halperin did on Thursday's Morning Joe it's grounds for indefinite suspension. While calling any president the D-word is probably not showing the proper respect for the office, it has to be asked where does it rank compared to essentially accusing a president of mass murder and war crimes? "If you believe in the seamless mutuality of government and big business, come out and say it! There is a dictionary definition, one word that describes that toxic blend. You're a fascist! Get them to print you a T-shirt with fascist on it!...You, sir, have no place in a government of the people, by the people, for the people. The lot of you are the symbolic descendants of the despotic middle managers of some banana republic to whom 'freedom' is an ironic brand name, a word you reach for when you want to get away with its opposite." 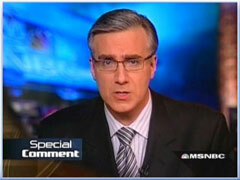 — Olbermann addressing Bush in a "Special Comment" on Countdown, February 14, 2008. — Olbermann in a "Special Comment" on Countdown, May 14, 2008. — MSNBC contributor Ron Reagan, Jr., during live coverage of the January 27, 2004 New Hampshire primary. MSNBC's Chris Matthews: "Russ Feingold wants to censure the President, the Vice President..."
Left-wing filmmaker Michael Moore: "Good idea....Personally I'd like to see a perp walk coming out of the West Wing of the White House." Matthews: "Do you think they're guilty of war crimes?" Matthews: "It's interesting if you go back....the Nuremberg Trials weren't about the genocide, it was about waging an aggressive war. I love reading some of that language. It's interesting."